The Industrial Revolution changed more things than manufacturing practices and output, vast numbers of country people, who had lived on varied home-raised seasonal foods were now crammed into city slums and living on mainly a wheat-based diet. In England, the Repeal of the Corn Laws had opened the gates to a flood of cheap, slave-produced wheat from the British colonies. Most of the new poor had no access to cooking facilities and a whole host of Pie Shops and Taverns set up in business to cater for the ever growing workforce. There were, as many culinary historians have grimly noted, excellent opportunities for hiding dubious ingredients within a pastry case and under a piquant sauce! The sausage was one of the first convenience foods ever produced, it was introduced into Britain by the Romans. One of the Tavern dishes which was not pastry-based and is still a favourite pub meal today, is sausage aka bangers and mash, often served with onion gravy. Like so many traditional recipes it carries its own flavour of nostalgia within it. Every ex-cottage dweller would remember the taste of home-bred pork, for before the Enclosure Acts even the Landless Poor had been able to keep a pig on common land. For the Irish immigrant workers too, this dish would have harked back to their home diet, which had been based around the potato. Pig keeping is one of the oldest forms of farming and the earliest pigs were part wild and fed themselves on foraged foods (sometimes with a little help, as above). In the 9th century, King Alfred's reign saw the introduction of pascua porcōrrum, or denbǽra, feeding rights, which became payable at the end of the fattening season, in pigs. 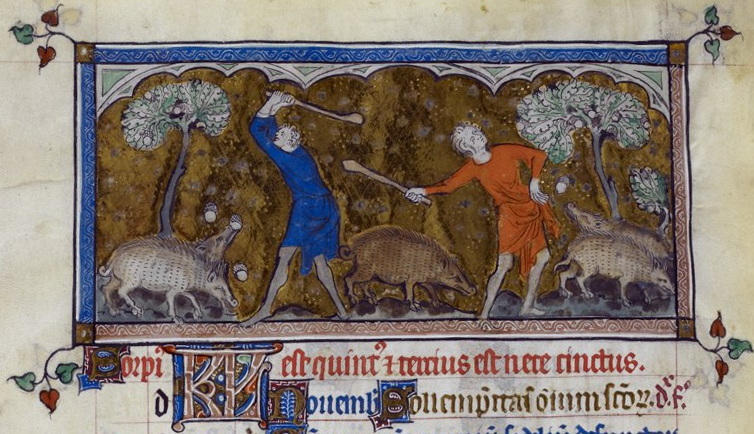 So much was this 'rental' a part of rural life that the practice became synonymous with the month of November, as seen above in the calendar page for that month in the Queen Mary Psalter c 1310 (British Library Catalogue of Illuminated Manuscripts). Here I'm offering an appetiser version of sausage and mash. We live in a longère (longhouse), which at sometime in the 19th Century was used as a Post House and where travellers changed horses and stopped for refreshment on their way to the Channel Ports. In one part of the house there is a fireplace that could accommodate a whole ox but I'm sure, given that people have been raising pigs here in the traditional way for centuries, I'm pleasing the old ghosts with the savour of sausage and mash. 3 Pure Meat Chipolata Sausages or 18 Cocktail Sausages. Form the mash into round balls small enough to sit neatly in the palm of the hand. Place in a buttered baking tin and cook on the top shelf of the oven until the potato has formed a skin but not browned (around 10 to 15 minutes). This will give them the appearance of mash rather than roast potatoes! Cut the onion into small wedges, spoon a little melted butter over them, place on on a buttered baking tray and roast for 10 to 15 minutes. Grill or fry the chipolatas until golden brown. Dry fry the sesame seeds until they begin to crackle and/or you can smell them cooking (around 3 minutes). Allow to cool. Mix them into the maple syrup to form the glaze. Keep everything hot in the warming draw until all the ingredients for the sticks are cooked. Cut each chipolata into six pieces, thread a piece of onion, a piece of sausage and finally a ball of mash onto the stick. Spoon the glaze onto the sausage. Place the sticks in the oven for a few minutes and then serve immediately. Despite the Fred Astaire and Ginger Rogers classic 'A Fine Romance', these appetisers are actually really tasty cold, particularly if the glaze is spooned over the whole stick. However, they are really good when hot.